Another late review! So, I backdated it to when I should have posted it. I'll fill in a few for June later and hopefully have some for July. 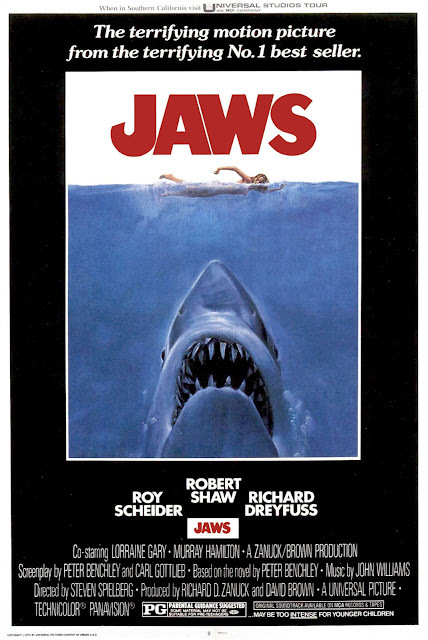 Jaws (1975) is Spielberg's blockbuster film that allowed him to make whatever films he wanted. A land-lubbing sheriff takes over the small island community of Amity just before its summer tourist season is about to begin. However, the mangled body of a young girl causes Brody some pause. The coroner rules it a shark attack and Brody begins to try and shut down the beach. The mayor and local officials quickly get the report changed and convince Brody that they need to let the beaches open. Jaws is such a classic suspense film that I doubt I needed that little introduction. 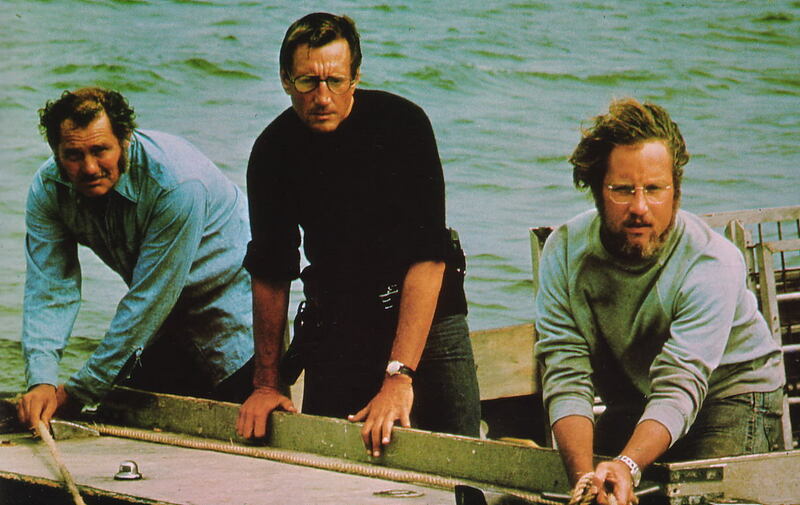 Jaws manages what few horror films can, making an ordinary situation blow up into full fledged hysteria. The pressure of money forces an upstanding lawman into ignoring the problem, until he must confront his fears to end the problem once and for all. A combination of the right script at the right time and a team with a dream. 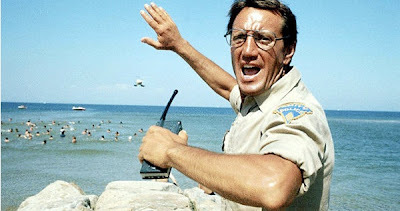 Chief Martin Brody is a family lawman who has a fear of the water. It's nothing deep, nothing psychological, just a fear. He genuinely wants to do the right thing with the shark attacks, but is clearly out of his depth. He allows himself to be dissuaded from his original conviction. After discovering the truth he's forced to cave via political pressure. All these things are understandable, but his conscience won't let him just lay down. Matt Hooper is an oceanographer called in to deal with the shark attacks. He provides much of the comic relief especially when paired with Quint. Despite being a humorous character, he has his own dramatic arc. He longs to be taken seriously and accepted by the elder Brody and Quint. Captain Quint is a shark hunter and all around badass. His entrance scene where he scratches his nails on a chalkboard is a bit corny nowadays, but you can't knock is overall demeanor. He is never in doubt of his abilities and is unwilling to even show off for free. If you want to write an awesome character, just look at this one. Jaws (aka Bruce) is a massive great white who eats people. What surprised me about seeing it again was how little our eponymous fish actually shows up in his own film. Jaws acts as an unknown terror and could represent either Brody's own fear of the ocean or humanity's general fear of the unknown. Or he could just be a big shark that likes the taste of human flesh. The island itself is picturesque. You really get the feeling of a summer trip to a beach city. Mind you, I live in California, so I can do that any time. The time period is also well preserved, harking back to a simpler time when kids had nothing better to do than take a summer trip. The ending is classic over the top adventure horror that has been copied and parodied so many times. I think the fact that it is so satisfying is the reason, it even provides a short epilogue for the surviving characters. Jaws is one of those films that is difficult to watch objectively. I think nearly every scene in this film has been copied or parodied or homaged at least once and that's probably an understatement. This film is a prime example of suspense and terror with a few flourishes. I think the scene where the mother of a shark attack victim shows up in full mourning garb to slap Brody should have probably been cut. However, compared to the scenes on the ship, the unnerving music and the dashes of genuine humor, a few excesses are allowed. This is a must see film.